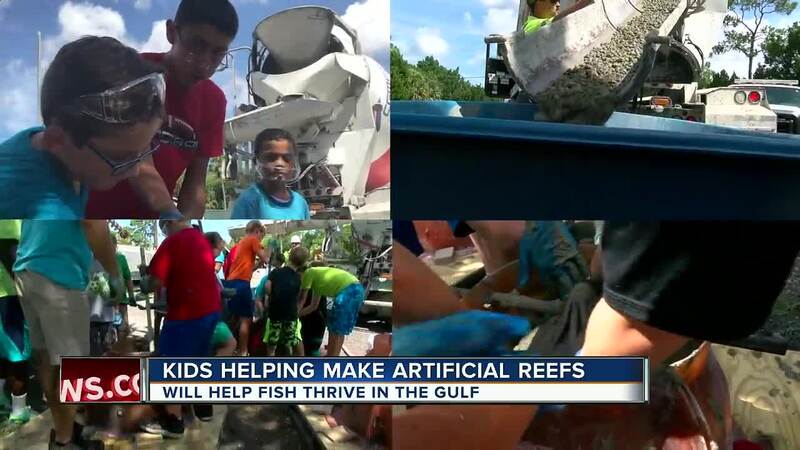 HERNANDO COUNTY, Fla. — Kids are helping make reef balls to become homes for the marine life off of Hernando County's coast. It begins with a reef ball mold, cement, and people willing to get a little messy. "I think it's good to help out the environment," camp-goer Nolan Shilcote said. Kids from the Hernando County Outdoor Adventure camp are working hard to help out the fish in the Gulf. "They learn a little about how concrete works, how it sets up and that you have to pack it," said Keith Kolasa, Hernando County Marine and Waterways Manager. Within the next year, the reef balls being made this week will be dropped out into the Gulf and become home to fish — just like other ones were last year. "When sharks come to get them, or any other dangerous animal they can hide here so they don’t get eaten," said Shilcote. "They actually start learning about what structures are needed to have better fish productivity and what sort of marine life lives in the reef balls," said Kolasa.